" Girvan Dundas was my father's step sister. She was born Eileen Dundas in Girvan, Scotland, 1908, and married the australian actor Jack Dunleavey Barker in 1927. Girvan wrote more than 20 songs with Jack Barker between 1931 and 1936, as well as one, called "Carry On" with Jack O'Hagan, the famous Australian songwriter. She was a very interesting woman, who died in 1944. She divorced Jack Barker in 1938 and married the famous jockey Charlie Smirke, winner of the Derby in 1934 and 1936. 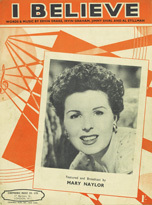 PS: I have sheet music copies of several songs she wrote, and I'm looking for others. 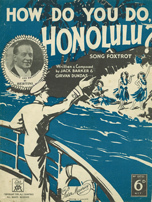 Girvan sang and made recordings with Charley Kunz in 1935, as well as with Harry Roy in 1940, both at the Kasani Club in Leicester Square, London. These old Sterno and Parlophone 78s are still around but I haven't been able to find them to purchase." "Mary Naylor is alive and well, semi-retired, in Orlando, Florida with her longtime loving husband, magician Jack Kodel. Mary and Jack are my husband's godparents, and we are collecting as many of Mary's old sheet music songs as we can. She has some of them, but we've found a few that even she had never gotten a copy of her own. Mary then signs them, and we proudly are presenting them to our two kids to have a special reminder of their Auntie Mary!...." mymotherssheetmusic.com is proud to wish Mary Naylor and her husband every happiness and to thank her for her wonderful songs....Phillip. 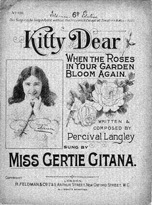 "Kitty Dear" written & composed by Percival Langley and performed by Miss Gertie Gitana. (c) 1911 Von Tilzer Music Co. I've recently been tracing my geneology and discovered that my great-great grandfather had four children. As they grew up, the national census of 1901 reveals the occupation of Percival Langley as "song writer" and that of his two sisters as "music hall". They appear to have been a musical family. The remaining child, Sidney, however, who is the one I am descended from, is listed as a gas pipe fitter! Nothing wrong with that but it perhaps doesn't have the same romance to it! So strictly speaking, I don't have any memories of this song at all. I've never heard it and I have no idea what the lyrics are. I can read music though and I play the guitar, so I am looking forward to being able to learn the song and hear the melody composed three generations of my family ago. I'm also looking forward to finding out what the lyrical content of a song called "Kitty Dear (When The Roses In Your Garden Bloom Again)" could possibly be! 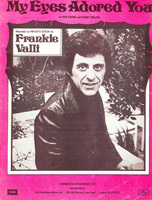 "My eyes adored you" written by Bob Crewe and Kenny Nolan and recorded by Frankie Valli (c) 1974 Tanny Boy Music Inc., USA. Back in 1974, I was 17 and madly in love with someone who was 24. His name was Tony. He was Italian and didn't even speak much English. My first job was at a local drycleaners, and he used to wait until "My Eyes Adored You" came on the radio and then he'd call me at work and hold the phone to the radio for me to hear. Well, his older brother didn't like that we were dating, and my parents didn't either, as I was still in high school and he was already out of school. So, we snuck around when we could, but my parent’s influence just made it impossible, so we broke up. I heard he went back to Italy, so I just figured it was over and he was gone. Life went on and about a year or so later, I was hanging out with my friends, when a green VW bug stopped at the stop sign and the driver, wearing sunglasses, kept staring at me. I had no idea who it was, but he drove around the block and came around to the stop sign again. This time he lowered his glasses and I realized it was Tony! Before I could even say anything or motion to him, he drove off and that was the last time I ever saw him. restaurant in California that had his name listed as the owner. I called the number and left a message for him to return my call. He called and it was him! Needless to say we've been catching up on so many levels and since he can now speak English SO much better, we're having a wonderful time! I'd like to be able to play this on the piano, so that one of these days I can surprise him by playing it. You know, maybe there IS only one true love for all of us. I think mine has come back.